NordicTrack Commercial 14.9 Elliptical Review by Industry Experts! The NordicTrack Commercial 14.9 Elliptical Trainer Is On Sale! The NordicTrack Commercial 14.9 is their premium front drive elliptical that has all the best features NordicTrack has to offer. This front drive model also has the benefits of being more compact and easier to mount and dismount. Besides the advantages that come with a front drive elliptical trainer, you get the typical array of features that distinguishes NordicTrack from their competition. Many of these features are designed to motivate you in achieving your fitness goals. WEEKEND SALE ENDS MONDAY: The NordicTrack Commercial 14.9 is reduced to $1,449. Financing is available. 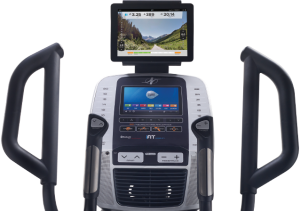 10” Smart HD Touchscreen — This console allows you to integrate with the iFit workouts and fitness tracking programs. iFit Live Technology — iFit Live is available on all NordicTrack elliptical trainers. Note: At the time of this posting, this machine comes with FREE 1-year iFit Membership. A great value! Create customized workout programs at your personal account at iFit.com. Based on your fitness goals like losing weight and getting in shape, your personalized workouts are downloaded onto the Commercial 14.9 and they control the resistance and incline of the machine. Each program last over over a defined period and is progressive in nature. The training includes audio coaching to further motivate you. After each work out your stats are downloaded to your iFit account so you can review your progress. Sync with Google Maps – Through Google Maps you can map out routes and your elliptical will simulate the terrain. You can watch your progress with street scenes on Google Maps. Once again you stats are downloaded to your iFit Live account for review. In addition, iFit Live offers a series of videos of famous landscapes and like the Google Map feature as you progress the NordicTrack Commercial 14.9 elliptical trainer will simulate the terrain. There is an additional cost for iFit Live. Integrated Pivoting Tablet Holder – The tablet holder is well positioned to hold your device above the console so it doesn’t cover up your workout stats. Comfortable 19” Stride Length — At this price range the length is typical and will accommodate most users. If you are very short or tall you may want to consider a different length. 32 LB. Flywheel — This is a fairly heavy flywheel that contributes to a very smooth and natural elliptical motion. It makes you feel like you are running in the air. This sense of floating on air really distinguishes a quality cross trainer from cheap machines. And it further reduces stress to your joints by eliminating jolting motion. Adjustable Oversized Foot Pedals — By adjusting the angle of the pedals you can reduce the potential of numbness that comes with excessive foot lift. In addition, they added extra cushioning to the foot pedals to further reduce the stress to your lower joints. iPod- Compatible Sound System — NordicTrack uses better sound components than most fitness equipment manufacturers. Other brands often have sound systems that are painful to listen to. Dual Handle Bar Grips — With the dual grips you can change up where you grip the handle bars, which allows you to target different parts of your arm muscles. Warranty — Lifetime frame, 6 year parts and 3 year labor coverage. One of the best residential warranties in the industry. 35 Installed Workout Apps — You get a generous selection of workout programs that target weight loss, incline and resistance training. Also included is a free heart rate strap so you can continually monitor your heart rate. Autobreeze Workout Fan – This over-sized fan automatically adjusts its speed to match your workout intensity. Pretty handy! NordicTrack C 12.9 – Read our full review here. The NordicTrack Commercial 14.9 elliptical trainer structurally is a solid built crosstrainer that offers a rewarding and ergonomic cardio work out. In addition, it is equipped with features designed to motivate and to alleviate the boredom of exercising in place. At $1,499, it is an attractive offer and with the various features and the optional iFit tecnology the NordicTrack Commercial 14.9 may be one of the best values for under $2,000. We feel very comfortable recommending this machine. Check back often as we update the prices on these machines daily! 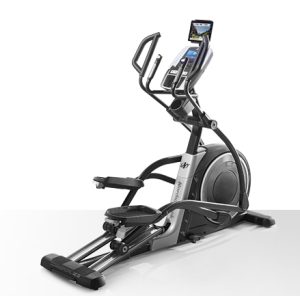 You can also see our comparison of all Nordictrack ellipticals here. 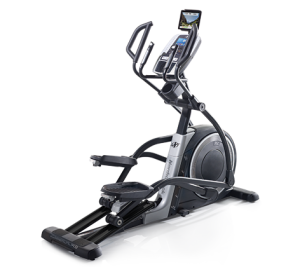 Go to www.NordicTrackEllipticals.com for further details. Does this Nordic 14.9 elliptical have wheels to move it ? The Nordic 14.9 Elliptical features front mounted transport wheels for ease of moving. What is the highest height of the pedals? I have a 7 foot low ceiling, so the height of the pedals matters. I currently have a NordicTrack ACT, and it works well. Hi Chris, add 15 inches to your user height and that is the vertical space required to operate.